Tech is transforming every industry, including sales. The number of jobs related to inside sales has dramatically increased in the last few years. According to this infographic by Salesloft, inside sales are expected to grow fifteen times faster than outside sales. Companies around the world are adopting B2B inside sales model as a way to cut costs and increase revenue. If you work in an organization that didn’t adopt this model yet you have come to the right place. 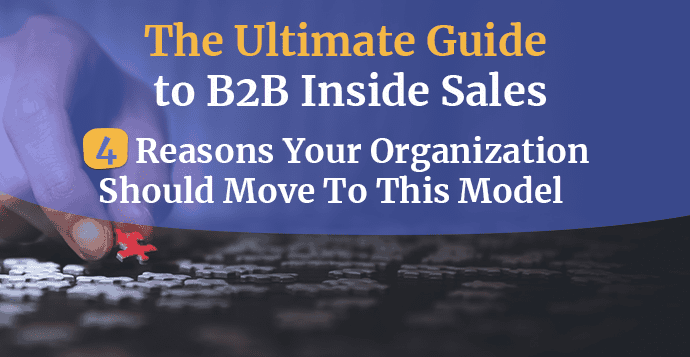 We have decided to write this ultimate guide on B2B inside sales and shed a light on what this model is all about. Inside sales are the most prevalent sales model for representatives in the B2B industry. It is also very common in tech, SaaS, and some B2C industries selling high-ticket items. Inside sales are handled remotely, in most cases over phone or email. They are also known as remote sales and virtual sales. In this case, an inside SDR is a salesperson who works in an office but does not visit prospects in person. They are also referred to as ‘remote’ reps. Selling over the phone is nothing new. Since the 1950s, many companies have used telemarketing to sell a product or a service. It is often believed that DialAmerica Marketing was the first company that used the telemarketing process. But, telemarketing is not the same thing as inside sales. This term was first created in the 1980s in an attempt to differentiate telemarketing to inside sales which are oriented towards more complex and more expensive ticket items. By the 2000s the term was used to make a difference between inside and outside sales. Inside sales is not a different term for telemarketing. We are going to explore each one in detail. Telemarketing is a scripted, single-call, that usually targets B2C sales and offers a small-ticket product. There is no strategy involved. Telemarketing is about engaging with customers only once. The deal is qualified as won or lost. Telemarketers cannot tailor their message because they don’t research their prospects. Telemarketing often relies on a purchased list of contacts. If you google “buy telemarketing list” you get almost 17 million results. Inside sales require a well-thought script which is customized for every account. The approach consists of multiple touch points. Inside SDRs are highly trained individuals compared to telemarketers. They ask a lot of great open-ended questions. A script is useful because it helps SDRs stay organized. It also prevents them from forgetting to say something. When it comes to prospecting, inside sales organizations don’t place lists at the core center of their strategy. Inside SDRs focus on finding high-quality prospects by the use of technology. Most B2B companies in the USA use CRM and other sales intelligence tools to perform searches, seek referrals and do general research. They also qualify their prospects which is not the case with telemarketing. Both, inside and outside sales are an important part of the sales organization structure. Inside sales rely on a more automated approach, while outside sales favor face to face communication. Below, we are going to explore each one in detail. Inside Sales Representative works from an office but sells remotely. They rely on the heavy use of technology. Phone, email, and video are the most important tools in their arsenal. They also have a clear target for each day – the number of calls to make, proposals to send, etc. Inside Sales Representatives need to have fantastic communication skills. They don’t have a luxury of meeting their prospects face to face and offering live demos to them. Phone communication skill is of great importance. Outside Sales Representative travels a lot. Although Outside Sales Representatives have employers with office space, they usually meet their clients at trade shows, conferences, and other industry events. This position better suits people who love to work independently and manage their own schedules. A decision whether to hire an inside or outside SDR will depend on the size of the company and its previous sales model. Outside SDRs are more common for large organizations. According to an analysis done by InsideSales.com, about 70% of large organizations hire outside SDRs. This number is expected to decrease as more organizations adopt inside sales model. Inside SDRs are more common for smaller organizations and startups. However, nowadays many companies are adopting a hybrid model of both inside and outside sales which makes the line between the two more blurred than ever. Many organizations treated inside sales as a supportive role for a very long time. Inside SDRs were there to execute some of the tasks and help their field sales colleagues close as many deals as possible. However, that has changed in recent years. The roles and responsibilities of many inside SDRs increased dramatically. Although inside sales have grown across different industries, it is most prevalent in B2B, tech and software industries. Inside sales model offers many advantages over an outside sales model. That is the reason why many B2B companies are choosing this model. Below, we will examine each one in greater detail. According to research done by Point Clear, the average outside sales call is six times more expensive than the inside sales one. Inside SDRs can have larger quotas because they are able to dial more leads and connect with more decision makers. Utilizing an inside sales team also eliminates travel expenses that typically go with outside sales. Did you know that almost 70% of your customers don’t even want in-person meetings? The key stakeholders have extremely busy schedules and this is why they prefer a video conference or a quick call. Also, they may travel frequently which makes organizing a meeting even more challenging. B2B deals are quite complex. On average they require 5.4 decision makers. This means that inside SDRs need to work in teams, in order to move leads through the sales cycle. Creating a powerful technology stack can help your organization move forward. The market has many tools that help inside SDRs dial and connect with more leads. This gives them an important advantage over outside sales representatives who aren’t leveraging sales acceleration technology. A B2B inside sales deal is quite complex. Its structure contains four important parts. We will examine each one in greater detail. The first step always starts with identifying your ideal customer. What kind of company do they work for? An effective sales collaboration with your marketing team will be necessary for outlining your ideal customer profile and buyer persona. After that, you should proceed with a list creation. Every sale begins with a potential customer. The same applies to inside sales. The inside sales lead generation process can vary, but the objective is the same – generate more leads! Successful lead generation begins with creating an ideal customer profile and buyer personas, depending on the industry, segment and existing customers. A lead is someone who has shown an interest in your business (usually by filling out a contact form of some kind and leaving contact details). A prospect is someone who doesn’t know about you yet but could become your customer if the time is right. It is important that the entire sales team understands your ideal lead, as this will help the marketing team generate relevant leads for the prospect team. If there are no inbound leads SDRs should cold approach people (call or email) who fit the target buyer personas. 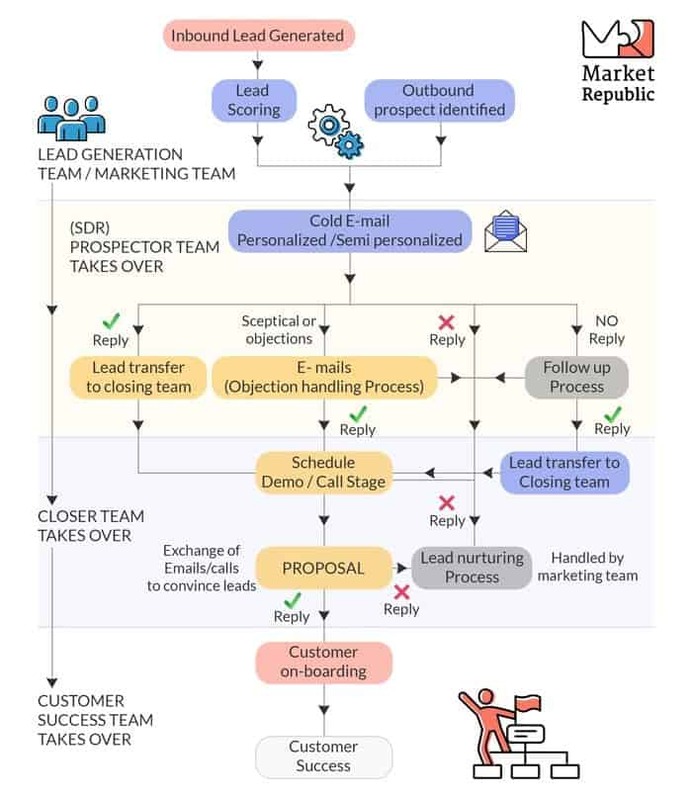 Whether you use email or phone, this is the stage in the inside sales process where the prospector team gets in contact with leads who may or may not know anything about the company or the product being offered to them. During this stage, you get into a conversation with the lead about the problem they have and where exactly your product fits in. You should not be shoving the product down their throat. Rather than completing the sale, the goal is to create interest and an opportunity for the sales team to give the lead more information about your product in his own time. You managed to get ahold of your let lead and rile him up, now he needs to test the product so he can make sure it works for him. The closing team needs to convince the lead to try the product and provide all the necessary information about the product which would help the lead make a decision and buy the product. The great thing in this stage of the process is that you are no longer a stranger. Your lead knows who you are and is willing to devote his time to your cause, which is really helpful in converting and making the sale. If the response is negative, the lead should be transferred back to marketing for lead nurturing. The final stage of the inside sales process is all about validating the price of your product and closing the deal. This is where the inside sale ends, and the customer success team takes over. Building your first inside sales team is not an easy task. There are a few things to take into consideration. When you first start moving to a B2B inside sales model, you need to hire the right inside SDR. Ideally, you should hire two. Hiring in pairs allows you to compare the performance of each SDR. It also gives your company more flexibility if one SDR decides to leave. Another great thing about this approach is that you can use both SDRs to test different methods and compare which one is better. Inside SDRs will be responsible for sourcing new sales opportunities, researching accounts, maintaining a database of prospects, and performing demos to potential prospects. If you are charged with this complex project the first thing you need to do is identify key metrics and goals for your inside sales team. Determine what you can expect once your team is onboard and based on past successes. When you bring new people to the team, you should have a strong training program in place. You need to be able to teach your team how to react to every possible sales situation. They also need to get familiar with the tools your company uses, so make sure to have a good onboarding plan in place. 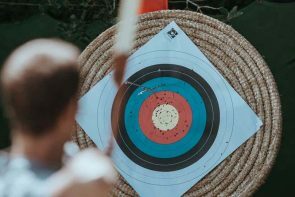 We have sifted through some of the test B2B inside sales tools that your company can use to build its technology and sales stack. Salesforce – The world’s number one CRM tool. It’s a great choice for small businesses looking to generate growth. Free trial available. Close.io – A number one CRM tool for many startups. It can be integrated with Zapier, Zendesk, and Wufoo. Hubspot – One of the most complete CRM tools. Hubspot is also completely free! Monday – Manage your sales in one visual tool. Monday is also great for onboarding your inside sales team. Pipedrive – A simple but powerful CRM tool. Used by Amazon, Vimeo, Skyscanner, and others. A plethora automated prospect list building tools – There are a lot of tools which scrape the web, verify emails and build their database. Some even claim to use AI, Blockchain or whichever trending buzzword. Differentiating factors would be price, UX and accuracy so we would advise you to try different tools and find the one which suits you best. Market Republic – What makes us different is our human approach and a deep understanding of the sales process. Unlike fully automated tools our research process is highly customizable and done by real humans (in-house, not outsourced) using tools we developed on our own. Our lists are made just for one customer with the highest accuracy on the market. Clients who use DiscoverOrg and other tools come to us when they can’t find any data for their market (think Africa, Asia, LATAM, DACH, Oceania). The future of sales will be invariably linked to technology. Mobile searches have already overtaken web searches in the US. Thanks to click-and-call technology, companies can expect to invest more on the inbound sales team. Sales acceleration technology will continue to grow too. That means that the reps will be able to get high-quality data. They will know better who to sell to, what to sell and when. Another interesting trend will be tied to the use of digital media platforms. Even B2B companies, that traditionally favored face to face meetings are adopting the digital approach. Many SDRs use Linkedin as one of their most important channels for building relationships. In a survey done by InsideSales.com, nearly 71 percent of 633 surveyed salespeople responded they are using some form of AI at work. About 90 percent responded how they believe that AI will help improve their sales performance. The use of AI will be one of the most important trends in sales. The world of B2B inside sales is evolving at a rapid pace and businesses will need to do a great job to keep up with these changes. Moving to an inside sales model will require a lot of initial effort. Instead of buying outdated scrapped lists in order to cut costs, get a top-notch custom prospect list tailored for your business. Lead generation is of utmost importance – and startups know this. That’s why they frequently jump into this practice making lots of mistakes that waste their money and damage their reputation. Check out what these mistakes are and how to avoid them.